WASHINGTON ― President Donald Trump fired acting Attorney General Sally Yates on Monday night, hours after she said the Justice Department would not defend Trump’s executive order on immigration. White House spokesman Sean Spicer said that Yates had been relieved of her duties. Dana Boente, U.S. attorney for the Eastern District of Virginia, was named as acting attorney general. Boente will serve until Sen. Jeff Sessions (R-Ala.) is confirmed as attorney general. The stunning move was reminiscent of President Richard Nixon’s “Saturday Night Massacre” in 1973, when he fired his attorney general and deputy attorney general, when they refused to dismiss Archibald Cox, the special prosecutor in the Watergate case. Earlier Monday, Yates wrote a letter stating she could not enforce Trump’s executive order banning refugees and immigrants from seven predominantly Muslim nations and instructing Justice Department lawyers not to defend the order. “At present, I am not convinced that the defense of the executive order is consistent with these responsibilities nor am I convinced that the executive order is lawful,” she wrote. Trump responded in a tweet, calling Yates “an Obama A.G.,” even though she agreed to serve as acting attorney general under Trump, and criticized Democrats for “delaying” the confirmation of Sessions. Yates was nominated to serve as deputy attorney general by former President Barack Obama, and was confirmed to that position in May 2015. Trump’s administration made the decision to appoint Yates as acting attorney general as well as to allow top federal prosecutors around the country who had been appointed by Obama to continue serving. Not long after the White House’s announcement, there was a flurry of activity on the fourth floor of the Justice Department building, located near the Trump International Hotel on Pennsylvania Avenue. Yates, accompanied by a significant security detail including members of the U.S. Marshals Service, was packing up her office into the evening. She declined an interview request that was relayed through one of the individuals in her entourage. Later, as a cart topped with boxes and bags was wheeled out of her office, an officer asked, then told, a Huffington Post reporter to leave the area. Around 11 p.m., Yates quietly left the building. The acting Attorney General, Sally Yates, has betrayed the Department of Justice by refusing to enforce a legal order designed to protect the citizens of the United States. This order was approved as to form and legality by the Department of Justice Office of Legal Counsel.Ms. Yates is an Obama Administration appointee who is weak on borders and very weak on illegal immigration.It is time to get serious about protecting our country. Calling for tougher vetting for individuals travelling from seven dangerous places is not extreme. It is reasonable and necessary to protect our country.Tonight, President Trump relieved Ms. Yates of her duties and subsequently named Dana Boente, U.S. Attorney for the Eastern District of Virginia, to serve as Acting Attorney General until Senator Jeff Sessions is finally confirmed by the Senate, where he is being wrongly held up by Democrat senators for strictly political reasons.“I am honored to serve President Trump in this role until Senator Sessions is confirmed. I will defend and enforce the laws of our country to ensure that our people and our nation are protected,” said Dana Boente, Acting Attorney General. On January 30, 2017, Acting Attorney General Sally Q. Yates issued a memorandum barring Department of Justice Attorney’s from presenting arguments in defense of the President’s January 27, 2017, Executive Order entitled “Protecting the Nation from Foreign Terrorist Entry Into the United States.” At approximately 9:00 p.m., I was asked by the President to serve in the capacity of Acting Attorney General. After having dedicated the last thirty-three years of my life to this Department, I am humbled and incredibly honored to serve as Acting Attorney General. 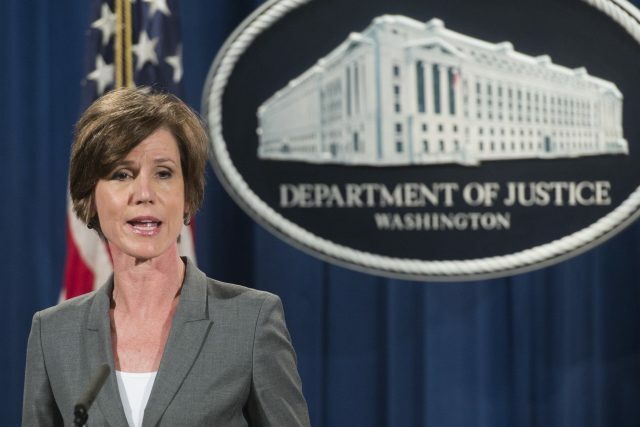 Based upon the Office of Legal Counsel’s analysis, which found the Executive Order both lawful on its face and properly drafted, I hereby rescind former Acting Attorney General Sally Q.Yates January 30, 2017, guidance and direct the men and women of the Department of Justice to do our sworn duty and to defend the lawful orders of our President.